I read this article and found it very interesting, thought it might be something for you. The article is called Rural India Faces 60% Shortage of Doctors and is located at https://archive.indiaspend.com/sectors/rural-india-faces-60-shortage-of-doctors. The Ministry of Health and Family Welfare came out with an official release recently about its ambitious target of achieving universal health coverage during the 12th Plan (2012-2017) period. IndiaSpend’s Sourjya Bhowmick looks at the rural health statistics in India (as on 2011), and the situation is worrying in rural health infrastructure as well. While Himachal Pradesh, with the highest rural population density, has the best health infrastructure, Madhya Pradesh has the highest number of health centres without doctors. And rural India has a shortage of over 12,300 specialist doctors (around 64%), vacancy for 3,880 doctors and a shortfall of 9,814 health centres. Incidentally, the National Rural Health Mission (NRHM) has spent around Rs 101,166 crore since its inception but key issues like rural healthcare infrastructure and access to medical advice leave much to be desired. Let us now look at these indicators in states that have high rural population, according to Census 2011. We can see that the rural population has not declined sharply in the last decade in these states. So, what is the average rural population served by a community health centre and a primary health centre? From Table 2, we can see that primary health centres in states like Jharkhand, Bihar and Madhya Pradesh cover more people than it is designed for. Even in the case of community health centres, the all-India figure is much higher than the objective that CHCs should cover 120,000 people. Table 3: How equipped Are Health Centres? We can see that the all-India shortfall of community health centres and primary health centres works out to 9,814. Uttar Pradesh and Bihar lead when it comes to shortfalls in CHCs and PHCs. It may also be said that more the rural population, the more it accounts for the shortfalls. Though the shortfall situation is acute, the reasons are not known from published government documents. Doctors (allopathic) and specialists form an integral component of the healthcare system but a lot remains to be fulfilled. It can be seen that around 1,100 PHCs (around 5%) across the country function without doctors in rural areas. 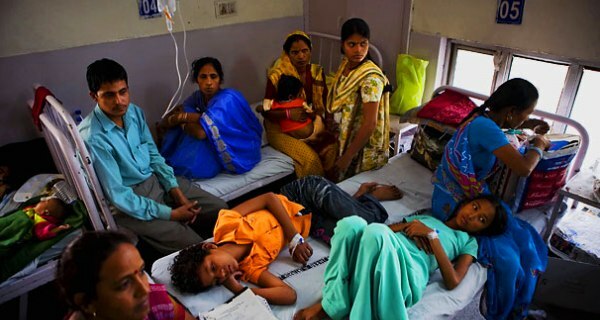 Chhattisgarh has the highest number of PHCs (243) without a doctor. All PHCs in Uttar Pradesh and Assam are shown as functioning with doctors. We also found that many community health centres lack specialists (surgeons, physicians and paediatricians). Rural India needs 19,236 specialists at its community health centres but it has a shortfall of 12,310 doctors, which is around 64%. Madhya Pradesh, Orissa and Rajasthan have the maximum shortfall in doctors at CHCs. * Around 47% of hospital admission in rural India is financed through loans and sale of assets. * 39 million Indians are pushed to poverty because of ill-health every year. Then what about nurse’s ratio in rural area.